I am a good cook.I am at the level that I can make a lot of good recipes, from scratch, off the top of my head.The recipes in this book simply don't work.The Porcupine Peppers recipe forgets to mention that the meat needs to be browned before mixing - so you will either ending up cooking the peppers for 1 hour and 15 minutes or, if you follow the recipe, die of food poisoning.The meaty lasagne doesn't have enough liquid in it to cook the noodles (I had to add about 1 cup of water). The Garlic Chicken and Tri-Colored Pasta didn't cook the pasta right, some was hard and crunchy and the rest was gummy.I have a stomachache from trying to eat the mess, and am very upset to be throwing away 2 chicken breasts, a box of pasta and 2 heads of broccoli because it didn't come out.This book is so bad that I am going to recycle it, I do not want to risk giving it away and having someone else get sick from the food.Yuck. THe book has quite good recipes.Lots of comfort food, easy, simple and umpretentious. I wasnt impressed by the recipes in this book. There was nothing new or interesting in the whole book. Just some simple and already known recipes. This is a cookbook with some of my favorite easy dinner dishes. I love to make dinner in the morning (or on another day) and just heat in the afternoon for dinner. I've tried a lot of the recipes and have been disappointed in only one. This is one of four cookbooks I use regularly. This cookbook just abounds with great recipes. I cook for a hunting camp and was tired of the same ole recipes, have tried half a dozen so far on the guys and have gotten rave reviews on each and every one of the dishes made. Have had to make a few adjustments for high altitude but other than that they have been a breeze to prepare. Thanks so much for this great book!!! 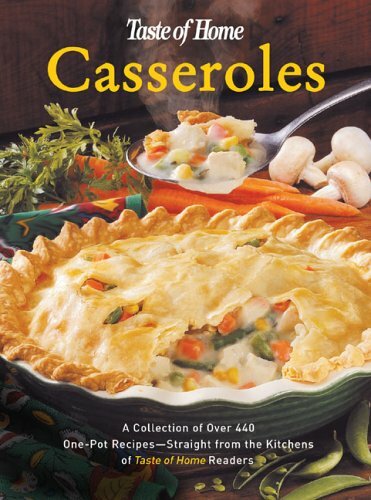 This really is the best casserole cookbook that I've ever decided to buy. The recipes are not overly complicated. They really bring something new to the table (pun intended) - even old standards. I love to read cookbooks like novels, but so far, every recipe I've tried has been as delicious as it sounded when I read it. The title says it all ... this is a wonderful addition to my cookbook library.I have also shared it with friends. Great seller, item arrived promptly.Haven't used the cookbook yet but highly recommend the seller.It looks like it has some great recipes. Regarding the print...I read reviews from people who had trouble with the color of the print, which was called orange and gray in some reviews.I thought that I had purchases a different version since I had no difficulty in reading the print.However, on closer examination, I found that the print in my copy is arguably orange and gray--tho more rust and charcoal. 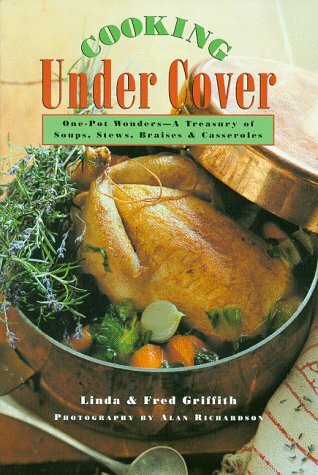 "Cooking Under Cover" offers 175 internationally inspired soups, stews, braises, casseroles and accompaniments, with a 15-page section of color photos by Alan Richardson. The authors ("Onions, Onions, Onions," winner of James Beard Award) prefer fresh, organically grown ingredients (including meat) and suggest wines and accompaniments. Chapters include desserts (Chocolate Pecan Bread Pudding, Maple-braised Plums, Figs and Blackberries) and appetizers (Rustic Terrine, Chinese Pot Stickers) as well as vegetable dishes (Curried with ginger and mint, Creamed Spinach), beans and grains (Red Beans with Spicy Sausage, Polenta with Mascarpone) and breads (Under-Cover Corn Bread). But the heart of the book is meat. How about Chicken Stew with Virginia Ham and Cornmeal Dumplings, or Nana's Chicken Fricasee which includes veal meatballs? Or Veal Shanks with Braised Lentils and Caramelized Onions, Pork Chops in Plum Sauce, or a real four-day Sauerbraten? While none of the dishes are difficult and instructions are straightforward, the authors' loving attention to detail makes the book especially suitable for cooking moods and entertaining. 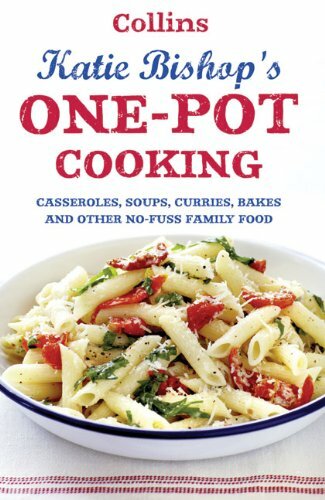 See review under Garlic, Garlic, Garlic.This one features wonderful one-pot dishes that are the equal to those in their other books.Very fine, indeed! If my house was on fire I'd grab this book on the way out... I never fail to find a great recipe in here, there is something for every occasion and for every taste.My family loves the recipes, nothing is too complicated or fussy. All the ingredients are available in the supermarket without a lot of hassle. It's perfect for those busy days when you are thinking 'what on earth am I going to get on the table tonight?' I have over a thousand cookbooks and this one is one of my absolute favorites.I love this book!!! A classic Taste of Home collection. I have yet to find a recipe that does not work from the TOH people. A valued collection for the TOH reader! Call it a one-pot, a casserole, or a hot dish, no one can deny the convenience and satisfaction these traditional meals provide! Whether you've had a late night at work, or have limited ingredients and finicky kids, the mighty casserole is the answer to the grumbling in everyone's tummy. 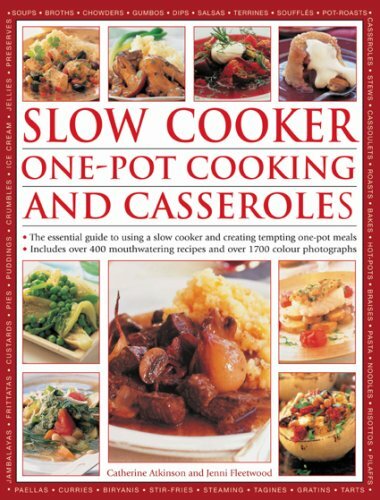 From the authors of the best-selling 101 Things to do with a Slow Cooker and 101 More Things to do with a Slow Cooker comes the sixth book in this million-copy-selling series-101 Things to do with a Casserole! While I have not had time to make any of the recipes, Most of them look easy enough to make.You don't need any special equipment to make them, and the ingredients are easy to come by. 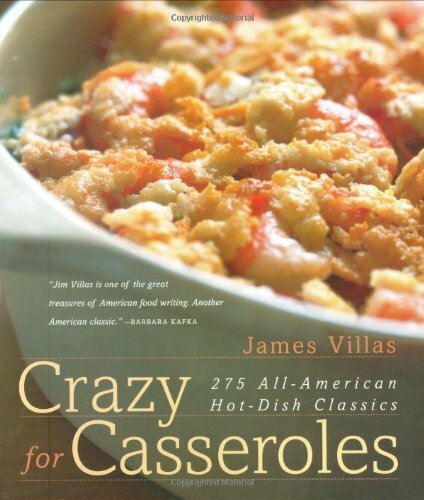 This book has the most casserole recipes that i have seen and most are mighty good. I can easily find a recipe to fit what I have in my cupboard. 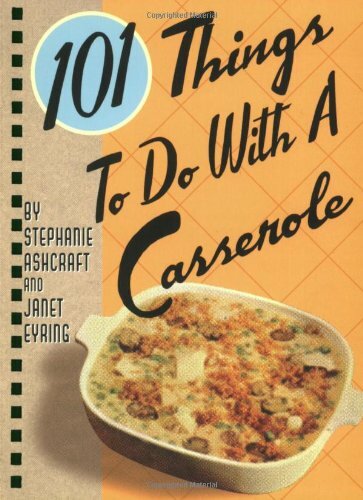 101 Things To Do With a Casserole contains hearty down home cooking for breakfast and supper meals. Though the majority of the one pan meals are meat-based, there is a whole section devoted to vegetarian cooking. Most of the dishes take about half and hour to cook but many can be prepared beforehand and then slipped into the preheated oven. Preparation is kept very simple with many of the recipes asking for commercially prepared soups, spaghetti sauce, pasta, crescent roll dough, etc. I loved this cookbook!Easy to follow recipes are simple to prepare with common, on-hand ingredients.Enjoy wholesome, low fat meals that your family will love! A cookbook really that delivers what it promises! Great Meals with Minimal Cleanup! The last thing you want to face at the end of a long day is a sink filled with pots and pans. What you do want is to sit down with your family to an easy, delicious, home-cooked meal—no muss, no fuss. The two are not incompatible! Here are dozens of entrées prepared start to finish in one single pot, most in thirty to forty minutes. All are easy to prepare and low maintenance, so you can help the kids with their homework or put your feet up for a rest while these aromatic dishes cook. From contemporary to classic, vegetarian to international, these dishes will please you, Dad, and the kids. You'll also find shortcuts and secrets to a more organized dinner and cleanup, recommendations for low-stress entertaining and classic Sunday dinners, and suggestions for salads and desserts to round out your meals. Have it all—delicious dinners, fewer dishes, and more time in the evening—with One-Pot Cooking! Fast and easy is right! I received this cookbook from my mom 3 years ago.I've used it so much since then, I've made almost every recipe.It has many dairy-free dishes in it which is great because I have a son who is allergic to milk.95% of the recipes have been a hit with my family.Each recipe lists the time it takes to make, and most of them are 60 minutes or less.There is a "Weekend Cooking" section in the back, and we have loved each and every one of these recipes! So far, I've made three meals out of this book. All have been fantastic. I checked the book out of the library and have now ordered one for myself to keep at home. I will continue to try more recipes from this book. Already, the three we tried (mexican lasagna, spicy shrimp and dried fruit pilaf, chicken pesto risotto) are staples on our family menu. I also enjoyed the suggestions at the beginning of the book about making cooking simpler - spending time on Sundays to prep cut veggies for the week, etc. 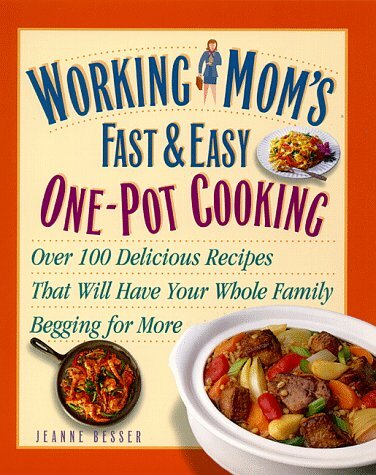 As a busy mother with only basic cooking experience, if I had to live off of one cookbook, this would be it. This is my favorite cookbook.Most of the recipes have foods from the entire food pyramid so that I don't have to cook separate recipes for a vegetable, grain, or meat for dinner.I also like that the recipes are very interesting - there are Asian, Indian, Italian, Mediterranean, etc. which really give my family a variety in meals and fun to cook also.I would not call this a lowfat cookbook, but there are quite a few recipes that are lowfat and several that you can substitute for low fat. This book has alot of wonderful, tasty, and easy recipes.It has a widevariety of tastes, from not so spicy to very spicy.It has made my lifealot easier to come home from work and know that, in most cases, within anhour or so I can have dinner on the table with a minimum of mess. Great ideas for fast, hearty and wholesome meals. You will find no canned soups in Maryana Vollstedt's The Big Book ofCasseroles. You will find 250 ways to simplify your weekly mealplanning. The properly deployed casserole is economical of both time andmoney. Anyone living on a family budget--with a family--but eatingaccording to a take-out lifestyle is going to love this book. Jambalaya is a casserole. So is Coq au Vin. So is classic HungarianGoulash. But let us not forget Turkey Tetrazzine. Or maybe we shouldforget. Maybe it's the Turkey Tetrazzines of the world made with leftoverdried-out Thanksgiving turkey coming at us after the days of turkey soupsand turkey sandwiches and turkey salads that have given the wordcasserole the kind of odor we look for behind the refrigerator. WhileVollstedt's version of Turkey Tetrazzine doesn't ask for a can of cream ofmushroom soup, and while it is made from fresh ingredients, the result isstill going to be the same. 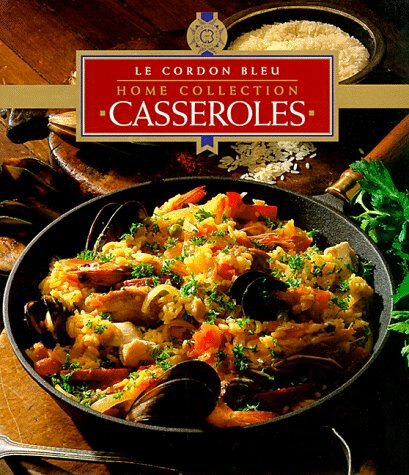 And that's one of the problems with The Big Book of Casseroles. It'sso big, the demands of coming in with 250 recipes are so great, thatclassics of the genre that would be better off left to foggy memory arerejuvenated for another generation of unfortunate diners. The other problemis how the definition of casserole gets stretched by the author. Anysubstance covered with another and baked in an oven appears to be acasserole. When is baked fish a casserole and when is it simply baked fish?Such are the questions raised by Vollstedt's choices. The book covers a lot of ground. 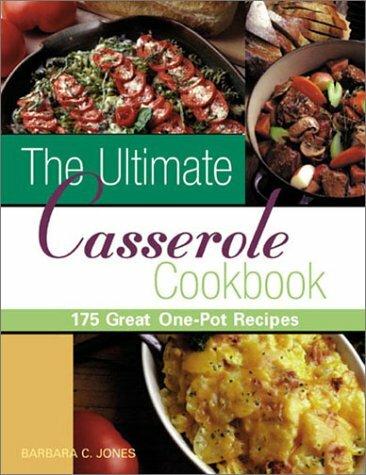 Chapters include those on "Basics" (as inwhite sauce), "Seafood Casseroles," "Poultry Casseroles," "Meat Casseroles,""Vegetable Casseroles," "Baked Pastas," "Grain and Legume Casseroles," "Gratins," and "Low-Fat Casseroles." There are no dessert casseroles. I got this cookbook last week and am currently making beef stew with parslied dumplings.It does seem like she uses the word "casserole" fairly liberally, like this stew for example, but so long as the results are yummy and she doesn't stray too far, I'm not going to complain.I already own a couple of her other books ("The Big Book of Breakfast", "The Big Book of Easy Suppers") and have always had great results from those books, so I jumped at the chance to add her casserole book to my bookshelf.One of the things I really like about her cooking is it's so easily accessible, no fancy ingredients or cooking methods, just super yummy food that doesn't take all day to make. You want a cookbook to be well-tested, so that most recipes work or "nearly" work.This cookbook, simply isn't it. Too many of the recipes have big or small flaws in them (e.g. a recipe says to add two cloves of garlic to a pot, does it mean whole cloves or minced?A different recipe said to cut garlic cloves in half & add to the stew; I get that. But this recipe looks like it was just a typo, dropping the word "chopped")The book is riddled with problems of this sort. Too many of the recipes are rather similar.Having tried one, I don't see a need to try the next three.I happen to like red wine slow-cooked with beef, but I just kept coming across one after another... without enough variation it seemed. 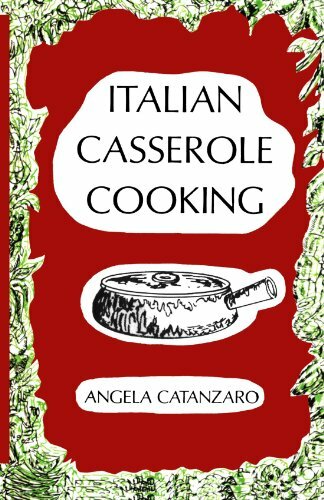 Some casseroles have no rice or noodles at all in them... is that a casserole or just a side dish of artichokes and broccoli in a mushroom sauce? The collection of recipes looks arbitrarily culled from various sources, e.g. one recipe calls for broccoli florets which must be steamed... another recipe asks for a package of frozen broccoli.Hunh?Why was one used here, the other there?No idea.They both end up heavily cooked anyway.One recipe calls for an onion, chopped... another recipe calls for 1/2 cup chopped onion -- hey, wait, why not make your recipes consistent?Because they were just gathered from different sources and the author didn't take the few minutes to standardize how she wrote out these recipes.You'd do better just pulling recipes off the internet at random, I think. Many recipes aren't casseroles, but stews. Who would write a casserole book that doesn't include a single "cholent" recipe?Any way you define casserole, a cholent is one; very long and slow baked in an oven. The thing you've probably got in your mind as mom's standard "casserole" is fairly scarce in this book.And the ones that are casseroles, seem very heavy on the cream, sour cream, or yogurt.At one point she writes that she hates the typical "can of condensed soup" added to a "tuna" casserole, but rather than give us a huge variety, her casseroles just strike a different single note. What's more, too many of the recipes I tried simply didn't work well.E.g. I found her french-style stews objectionable (cook something 2 hours, put in onions, cook for 1/2 hour, add mushrooms, cook another 1/2 hour... thicken with flour/water in last 5 minutes... wait, that's pretty horrible.How about making a roux, or flour-coating the beef before browning so it'll thicken on its own as it slow-cooks, that tends to work better than dumping flour/water in 5 minutes before serving it... That was a bad corner to cut. )Sorry, but tossing a can of artichoke hearts into a stew is NOT a great innovation in my book.And if I see one more stew that uses the same 14-1/2 oz can of tomatoes, chopped up and added with the juices ... sigh.She eschews cans of condensed soup, okay, but then she adds other canned goods in much the same manner. The cassoulet recipe simply didn't cut it; too many substitutions to make it easier but it lost its authenticity.The Moussaka recipe didn't have any sort of bechamel in it -- that's not moussaka!!! How's this for silliness: fry onions in veg oil, then add butter to the pot, then stir in flour (recipe describes making a roux).Think about it and you'll see the sort of NON-thinking that went into this book.Oil? Then butter?You couldn't fry the onions in butter then immediately make the roux?Or make the roux using the oil already in the pot?There's no brain behind this book. In other words, my summary is: (1) not a good representative mix or variety of casseroles(2) recipes are troublesome, or cut corners poorly(3) poor writing and errors means the book wasn't edited well. 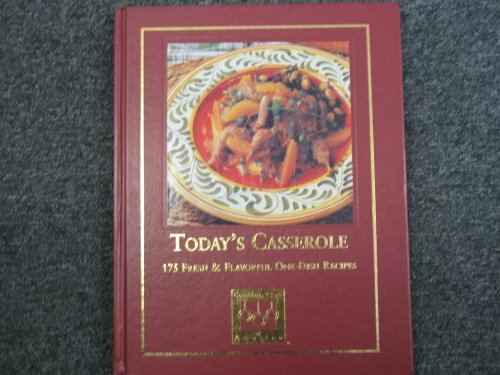 Although I have not made any of the recipes yet, the book has lots of delicious looking casseroles that are very easy to prepare.The recipes for the most part are healthy and not loaded with gobs of butter and cream.I would recommend this book to anyone who loves casseroles (and casserole leftovers!! ).Nothing is better than a steamy hot casserole served with rolls and a crunchy salad! Purchased this cookbook as a gift, so I didn't get to leaf through it like I would've liked.I'm sure the person who received it is enjoying it. One of the easiest and 'kitchen cook' dishes to prepare and serve for family mealtimes is the casserole, a single dish entree that is almost infinite in its variety. Compiled and organized by Rebecca Baugniet, "500 Casseroles" is a particularly impressive collection of easy-to-prepare recipes for a wide diversity of one-pot dishes ranging from Tamale Casserole; Rigatoni & Italian Sausage Bake; Coq Au Vin; and Turkey Gougere; to Baked Snapper with Mushrooms; Chilaquile Casserole; Cauliflower & Red Pepper Casserole; and Italian Risotto with Scallops. 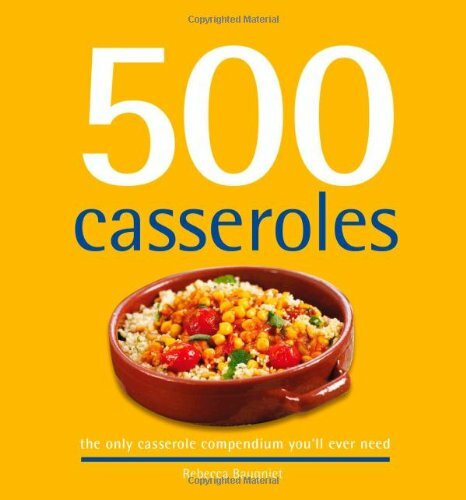 Beautifully and profusely illustrated throughout with color photography, "500 Casseroles" will prove a popular culinary addition to any personal, family, and community library cookbook collections. "Bake until Bubbly . . . the name says it all. Visions of creamy, tender casseroles with crusty, crunchy tops immediately come to mind and Clifford Wright's book delivers. You will find easy-to-make one-dish recipes like the rustic but elegant Veal Saltimbocca and Cassoulet and comfort food such as Blue Cheese Halibut Bake; Sausage, Red Bean, and Apple Casserole; Cranberry-Apple-Walnut Crisp; and Blackberry and Cream Cheese Cr?pes Casserole. I love the fact that you can find everything from breakfast casseroles to vegetarian options to desserts. The Potato, Bacon, and Gruyere Casserole is coming to my next potluck." "Just when I thought there was little left to be exploited in casserole cookery, Clifford Wright comes up with an herby tamale pie with cornmeal mush, an Irish rutabaga pudding, a baked rigatoni with meatballs, a nectarine and almond dessert casserole, and numerous other fascinating dishes guaranteed to add new and exciting dimension to this succulent style of cooking." I sent this book to a friend and she loves it.It is full of delicious recipes but a lot of butter and cream is used in too many of them for those are restricted diets. She is very please with the book and plans to make many of the recipes. I am a mild cookbook browser. I don't do the cooking at home, but from time to time, I will look through a cookbook that for recipes that meet the approval of she who does everything better than me. The biggest drawback to this collection is its total lack of photographs. Not a one, except on the cover. Sorry, but photos of mouth watering dishes help a lot. Lots of photos help even more. No photos suppress the appetite. The design of the book doesn't help either. Red and brown type. The layout, if not the editing as well, is horrible, A recipe for tamale pie is described in 1-1/4 pages of text. There are no paragraph breaks. Not a one. There should be at least eight by my reckoning. As a result, the description with its directions is difficult to read, not an attribute you want in a cookbook. The layout is also monotonous with each page looking like all the others. Finally the recipes aren't all that unique. But there are many other casserole cookbooks that are far more visually appealing, easier to read and whose recipes are more appealing. 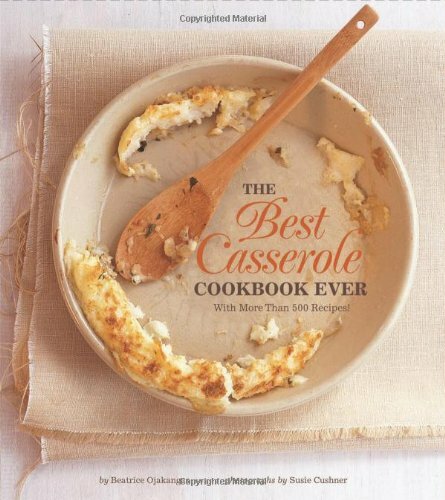 I've loved -- really loved -- every casserole I've had from this book. Sure, some of the recipes take some time;most things that are worth it require more than 5 minutes of prep.But the benefit of taking some time making really great casseroles is that you've got really awesome leftovers.And casseroles usually freeze well. I'm mystified at all the disappointed reviewers who bemoan the lack of pictures.Uh, seen one pic of a 9 x 13 pan with a golden brown top, seen 'em all?Who needs pics?I know what a casserole should look like.And if you're not sure, you can look at the cover. I like the categories -- makes it easy to decide what I want to make:meat/no meat, rice vs. pasta, vegetables as main ingredient or meat. I like the range of the casserole offerings -- many different cooking traditions are well represented here.I also appreciate that there's not just one or two chicken casseroles, but well over a dozen. I dunno, bottom line, I just really like the book.Like most ppl reviewing this book who wrote positive reviews, I'm at home in my kitchen, own lots of cookbooks, don't need a lot of hand-holding, have the confidence to alter recipes to suit my taste.It may be that every recipe in this book is not best suited for the beginner/unsure cook or for those who want or need to make quick pull-together casseroles, but there are plenty that seem accessible to every level. For those of you who are wavering on whether or not to buy this cookbook, the Tamale Pie recipe is worth the price of the book alone.I'll tell you right up front, it's a time-consuming recipe with some mildly tricky bits.But it's worth it.And it makes a lot. If you're intimidated, do what I do and make it with a friend.My sister and I get together on a Saturday now and then and make some recipe that's complicated and involved and maybe even a bit scary ("we're really supposed to set this on FIRE?!" "that's what it says" "let me see that book").We always make a double batch so we each get to take some home for leftovers, thus our labor is halved b/c we are sharing the making of the dish and our pleasure is doubled because we get all the fun of doing something together and then we have fabulous food for the coming week. Btw, there's no fire involved in making Tamale Pie.I made that up. The book came quickly and the service was terrific.I was notified in advance when to expect delivery and my book arrived as promised.I highly recommend this seller. A broad range of recipes written with a facile hand -- well-written with a little background information on each recipe. The layout is a bit loud but doesn't interfere with the information. There are different sections for various types of casseroles and some unusual but not exotic ingredients and combinations. No apologies are made for store-bought pastry crusts nor use of condensed soups. The tone is worldy but down-to-earth. I'd recently read by Mr. Villas and was impressed enough with that cookbook to purchase this one and I'm not at all disappointed. A friendly, knowledgeable voice throughout. Excellent cookbook overall. Lean but thorough with no waste whatsoever. No outlandish recipes. Highly recommended. Most of these dishes required being cooked before being put in the oven. Most of these casseroles require a lot of prep work in the beginning and then after already cooking it you put it in a casserole dish and put in the oven for another 1 to 1 1/2. After spending 45 minutes to cook the rice and then another 20 softening the vegetables and then frying the chicken you could just serve it as is rather than now putting it all in a casserole dish and baking it for 60-90 minutes.I'm making casseroles to beat the clock not fight against it. The author self-admits he does not watch calories so many of these recipes are full of full-fat sour cream, butter, milk, mayonnaise, cheese, etc.You would just have to make your changes based upon your dietary needs. I think many might find the food combinations a little bizarre.Pimentos, mushrooms, tuna and boiled eggs.I did make the Chicken Divan with almonds and we ate it before it even made it to the casserole dish.I had to cook the broccoli first, then make the sauce so I just needed to take 10 minutes more to cook the chicken slices rather than pouring it all in a casserole dish and waiting another 35 minutes.How strange to have a casserole book where everything gets cooked before it gets put in the casserole dish. 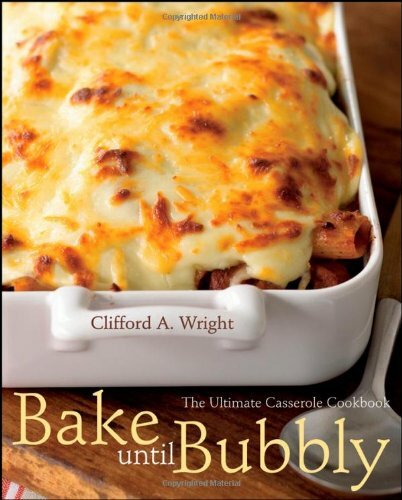 I would pass on this one, try Bake until Bubbly: The Ultimate Casserole Cookbook instead. I'm a single girl with very little baking experience, and I took this cookbook out of the library because I like cooking large portions that I can eat throughout the week. 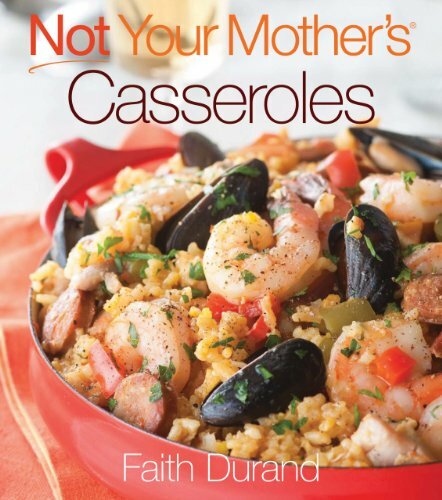 I like the idea of making casseroles for that purpose. While the book is great to read and all the descriptions sound mouth-watering, it's hard to find a recipe that isn't loaded down with butter, cream, cheese, and/or eggs. Even the non-meat recipes are extremely fatty. Tonight I made the Monterey Celery, Almond, and Water Chestnut Bake on page 67. Not knowing enough about baking to be comfortable substituting lower fat ingredients without worrying that it would ruin the dish, following the recipe I used an entire stick of butter, three-quarters of a cup of half & half, and a half cup of Parmesan cheese. I was hoping it would turn out to be a very rewarding bunch of fat and that I'd be so happy I made it. However, tasting the casserole, it's not bad, but it's overly buttery and creamy. I ate one serving of it just now and feel kind of gross, which is not how I like to feel after eating a home-cooked meal. So it's a shame that not only does this recipe involve tons of butter and cream, but it's way more than is needed in the first place. 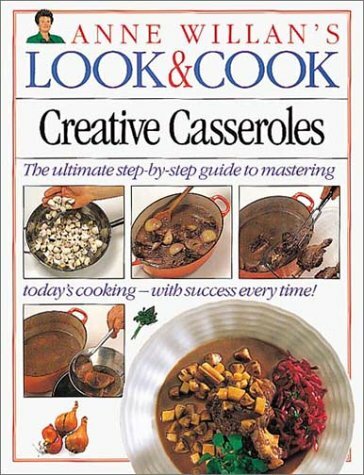 Another issue I have with this book is that nearly every recipe is complex and involves several phases of cooking before you even get to the casserole dish. Based on a couple of the other negative reviews, it seems many of the recipes fall into these traps. I'd say the book is worth taking out of the library, or even purchasing, if you want casserole recipes for buffets, potlucks, or other special occasions. It's especially helpful if you're a skilled baker and are just looking for some new inspiration as there are casseroles in here involving a number of different meats, seafoods, vegetables, fruits, and grains. But if you're looking for a practical cookbook of things you can make any day of the week, look elsewhere. 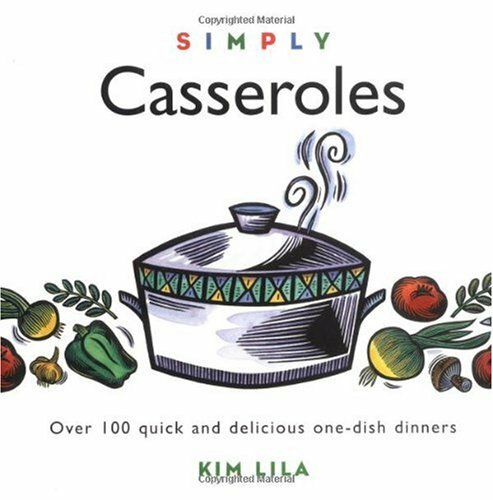 This is a lovely, cheerfully written cookbook, and only one recipe I have prepared from it has been any good.The rest are boring and flavorless.I love casseroles, but I've finally given up on this book. Update 11/12/2007:OK, so I didn't give up. I just made the San Antonio Chili Casserole.Sounded good:chili with a cornbread topping.Did he leave out ingredients for the cornbread or what?Butter and eggs and nothing else?Added some buttermilk, and although the chili wasn't terrible -- standard beans (lots of beans) and ground beef -- the recipe had to be tweaked too much to call it a success.Get some Junior League or community church cookbook if you want these recipes -- anything! Update 01/26/2009:OK, because I am a masochist (and apparently a sadist to my family), I tried one more recipe (Mamie's Ham and Black-Eyed Pea Supper), and I now plan to permanently delete anything by Mr. Villas from my recipe file.You have been warned. These are too much work! Breakfast, lunch, dinner, or brunch: a casserole always makes a hearty, delicious all-in-one meal. So get out the oven-ready pot or pan and start cooking! There's something for everyone here: the vegetarian; the meat, chicken, or seafood lover; the fan of rice and pasta. And, the recipes will redefine your idea of what a casserole is, because they're not just the same old boring stews. Need something quick for the morning rush? Try a bake of breadcrumbs, spinach, cottage cheese, parmesan, and eggs. Mix it up, stick it in the oven, slice it, and enjoy. Serve a delicious medley of roasted vegetables and pasta fit for a king: a combination of cheeses top it off. Make supper a super fiesta with South American Chicken, all wrapped up in hearts of palm. From Holy Stromboli to Banquet Mushroom and Potatoes, these meals are unforgettable. Plus--all the casserole cooking basics you need for perfect preparation! This book has some of the best recipes I have ever seen.Everything is so simple to make and I always get lots of compliments on the dishes I prepare.Everyone in my office thinks I'm the best cook ever!! !LOVE, LOVE, LOVE this book.It will be a staple in my kitchen. Ideal for those who love cooking but are tired of washing pots and pans, this guide contains more than 100 delicious and easy-to-make recipes that can be cooked in just one dish. Bestselling food writer Katie Bishop shows you how easy it is to produce fast, hassle-free meals for the whole family. From favorites such as chicken curry and oven-baked risotto to Asian-inspired noodles, stir-fries and mouth-watering desserts, every recipe will delight those looking for good food that requires minimal clearing up. Katie's straightforward, helpful style and inspired recipes, which use easily attainable supermarket ingredients, will be loved by anyone who wants to produce perfect meals every time.